Sgt. 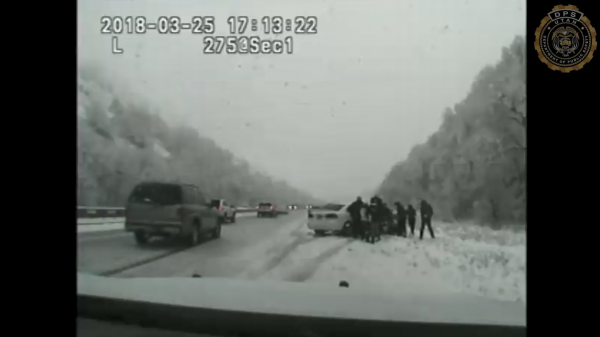 Cade Brenchley had no idea what was coming as he walked toward the scene of a slide-off on a snowy highway in Sardine Canyon, Utah, on Sunday, March 25. It was 5:10 p.m. when the 13-year veteran of the Utah Highway Patrol arrived at the scene on Highway 89. He exited his cruiser and was about halfway to the other vehicle when a black sedan sped up from behind him and made impact, sending him into the air. “I stepped out and that’s about the last thing I remember,” he said during a Tuesday press conference broadcasted by ABC4. 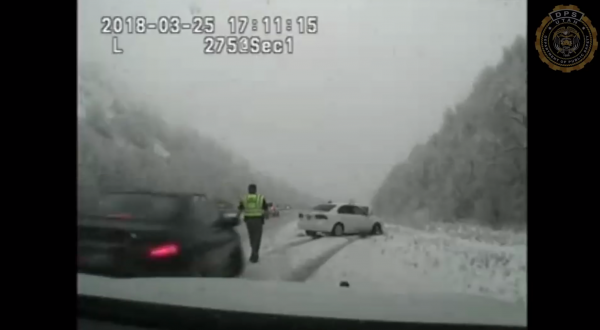 Dashcam footage of the incident was published by the Utah Department of Public Safety. From the footage, it seems that the driver of the black sedan had trouble keeping the car under control. Brenchley landed by the car in front of him. Multiple people rushed to his aid. “I woke up and I saw snow and I was laying there,” he said. “I knocked the wind out of me. I was gasping for air. I was right up against a car. Somebody used Brenchley’s car radio to call for help. Brenchley, a father of four, is “well respected and known in his community,” the Public Safety Department stated in a press release. He serves as a local soccer coach, leads the department’s public information and education efforts, and works with local high schools. He previously helped deliver twins on the side of the interstate and helped save a burn victim in a car crash. He was transported to Logan Regional Hospital with four broken ribs and a broken scapula but “otherwise without significant injury,” noted his physician Dr. Allen Anderson. “He’s really done remarkably well,” Anderson said. Brenchley expressed gratitude to people who helped him and supported him, as well as gratitude for being alive. “I watched the video [of the accident]. I watched it couple of times and I truly believe miracles do happen,” he said. Brenchley also urged drivers to mind road conditions so similar accidents can be avoided. “When there’s snow on the road, you just need to check your ego and slow down,” he said.